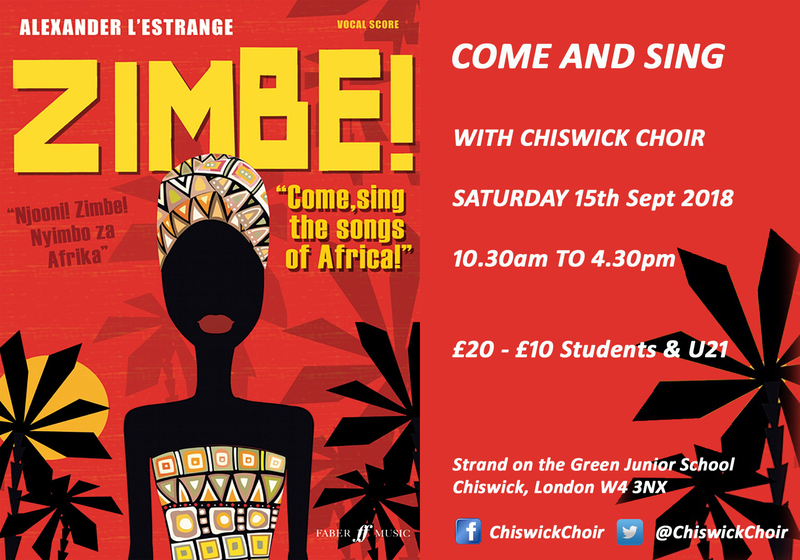 Chiswick Choir, a choral society, is holding a Come and Sing day on Saturday 15 September 2018 at Strand on the Green Junior School, London W4 3NX. We will be learning movements from 'Zimbe! ', a celebration of music from across Africa arranged for choirs by Alexander L'Estrange. We are an amateur choir of around 80 singers that has been rehearsing and performing in Chiswick for over 40 years. In addition to the ensemble singers, we nurture aspiring professional singers through a programme of choral scholarships. The choir performs at least three concerts each year, and has covered a wide repertoire ranging from classical choral works from the 16th to 20th centuries to more contemporary pieces. Highlights from the forthcoming year include performing services at York Minster in August 2018, and a summer concert at St John Smith Square in July 2019. Please arrive between 10:00 and 10:30am to ensure we have sufficient time for registration, introduction and refereshments. Our vocal warmup will start propmptly at 10:30. Refreshments of tea and coffee will be provided. There is a corner shop as well as several small cafes and pubs a minute or two from the venue, although we recommend you bring a packed lunch if possible. The day will conclude with an informal performance of the music we have learned, to which you are very welcome to invite friends and family.